Bonhams is the title sponsor of the Royal Automobile Club’s London to Brighton Veteran Car Run held each year for cars built before January 1, 1905 in commemoration of the original Emancipation Run in 1896 when a self-propelled vehicle no longer had to be preceded by a walking person or constrained to a 4mph walking pace. The speed limit became a frightening 14mph. The continued success and attraction of the Brighton Run is evident not only in the 400+ entries in this year’s event but also in the exceptional prices which Brighton Run eligibility confers upon the cars that qualify, prices evident in this relatively small (but with nearly twice the consignments as last year’s sale) auction. That attribute is seen also in other auctions, like Bonhams sale eight days later of the Bothwell Collection in Woodland Hills, California. The Brighton Run is a legendary event. 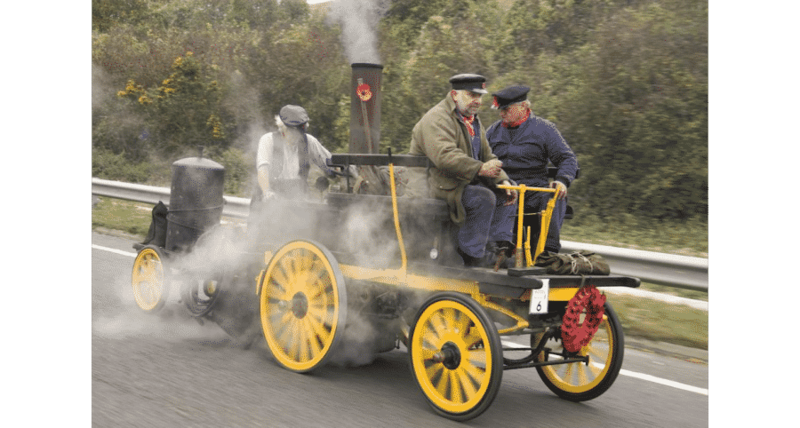 Usually characterized by chilly and often damp weather that challenges the endurance of participants and spectators as much as it challenges the simple, rudimentary steam, electric and internal combustion powered vehicles built well over a century ago. 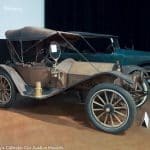 For years pundits have noted the passing of generations and predicted an incipient demise in the appeal of ‘the cars they grew up with’ to aging collectors passing out of the hobby. The popularity of the Brighton Run, and the incremental monetary value of vehicles eligible for it, is object evidence of the fallacy of that inference. There is no one alive who made the first Emancipation Run, nor many of its successors even after the Run was revived in 1927. Collectors brought up with ‘the cars they grew up with’ come to appreciate the original thinking, elemental design, imaginative construction and, in some cases, impressive speed and durability of these earliest self-powered vehicles, many of them (at least 60 in this year’s Run) constructed before the turn of the twentieth century. Young people are drawn to the vehicles’ fresh thinking, their simplicity that makes even a modern lawn mower seem sophisticated, their up high and exposed driving positions and the driving process that entails not only keeping the vehicle on the road but also monitoring their function and constant attention to lubrication, not to mention keeping the steamers’ water tanks full. It is the antithesis of self-driving cars. One of the more significant aspects of Bonhams auction is that several of the vehicles had confirmed entries for this year’s Brighton Run: buy on Friday and take part on Sunday, a rare opportunity to experience nearly-instant gratification after spending a great deal of money and probably making another expensive trip to Barbour for suitable weather-resistant attire. All but one of the vehicles offered were sold, a 96.2% sale rate that was far better than last year’s 71.4%, aided by a collection of vehicles from a European collection that filled up the consignment with rare and unusual – and in some cases blissfully original – examples. The cars in Bonhams sale are sorted in lot order. The observations and comments are taken from the catalog and online photos; condition ratings are, uh, approximate. Photography is from Bonhams catalog or website and are © 2017 by Bonhams or their respective photographers. Lot # 201 1901 Royal Enfield 4 1/2hp Forecar Quadricycle; S/N 16403; Green/Black; Estimate $32,668 – $39,201; Not viewed, notes from the catalog, 3- condition; With Reserve; Hammered Sold at $57,495 plus commission of 15.00%; Final Price $66,119. 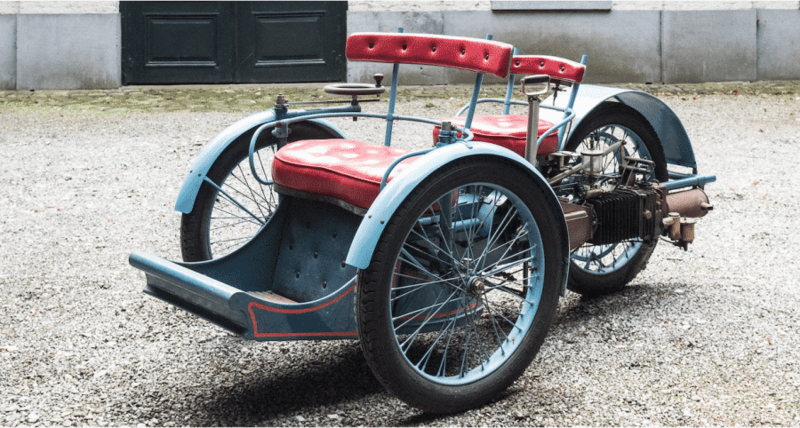 – Handlebar steering, rear-mounted single cylinder deDion-Bouton engine, cycle fenders, 3-seater with front-mounted passenger seats, kerosene headlamps and taillight. – Restored long ago and museum displayed for many years. 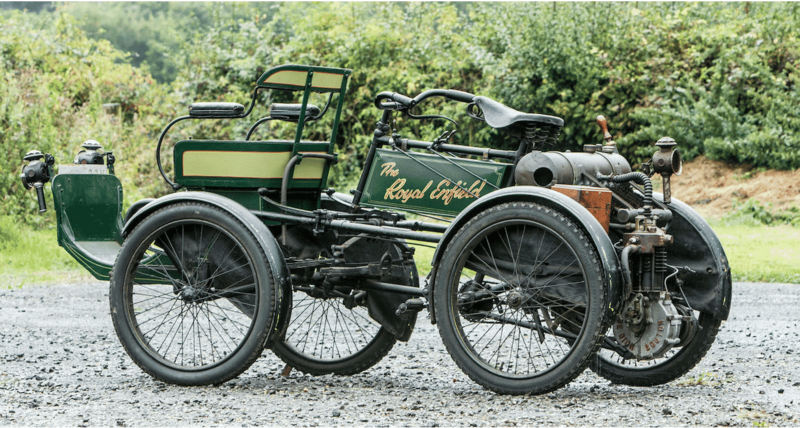 Not running and in need of both mechanical and cosmetic attention, typical of museum vehicles but seemingly largely complete – ‘Charming’ is hardly adequate to describe this elemental internal combustion powered vehicle and the bidders more than endorsed its charming-ness with this result. A golf cart is orders of magnitude more sophisticated, but both accomplish a similar result. The Royal Enfield has more style, even at ten times the price. 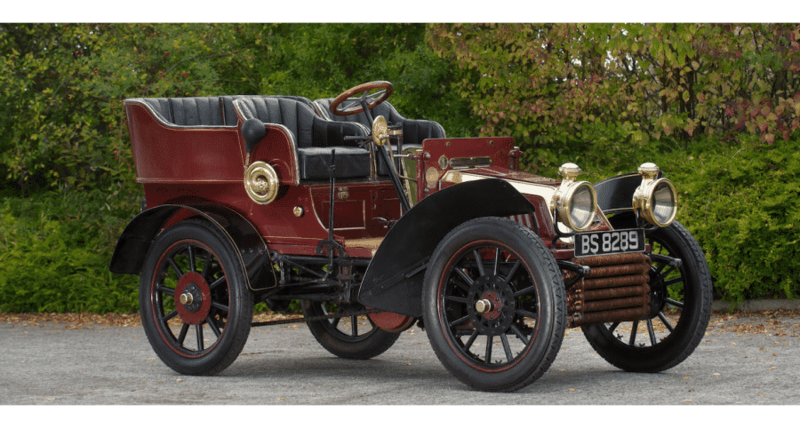 Lot # 202 1901 Darracq Model C 6 1/2hp Two-Seater; S/N 945; Maroon, Brass accent/Black; Estimate $52,268 – $58,802; Not viewed, notes from the catalog, 3+ condition; With Reserve; Hammered Sold at $65,335 plus commission of 15.00%; Final Price $75,135. – RHD. Wheel steering, kerosene sidelights, bulb horn, varnished wood spoke wheels, leather-covered luggage trunk, 3-speed gearbox, shaft drive. 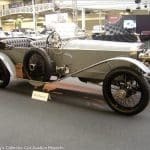 – Built up from a pile of Model C parts including the chassis, engine, springs, front and rear wheels, axle, valve controls, gear quadrant, steering shaft and pedals with a reproduction body, VCC dated and an LBVCR participant. In good if not fresh condition and in need of nothing more than a new caretaker. – A quality Veteran automobile with many advanced features for its day, this is a serious LBVCR participant that has been recently checked by a specialist (NP Veteran Engineering) and needs little if anything to show its stuff on events and tours. The bidders saw the value in its condition and made no excuses for it. Lot # 203 1901 International 6hp Charette Rear Entrance Tonneau; S/N 140; Maroon/Dark Green leather; Estimate $78,402 – $104,536; Not viewed, notes from the catalog, 3+ condition; With Reserve; Hammered Sold at $75,789 plus commission of 14.59%; Final Price $86,843. – RHD. Vertical shaft rack and pinion wheel steering, belt drive, 1-cylinder deDion-type engine, kerosene sidelights, bulb horn, black wire wheels, umbrella basket. – An obscure British marque but this example has been known to the VCC since the earliest days of the LBVCR with dating certificate #20 and a regular Brighton Run participant. Restored in 2000 and remarkably clean, crisp and orderly. – In LBVCR terms this International might be characterized as ‘comfortable’ or at least as ‘roomy’. 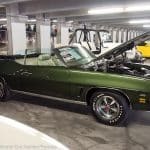 Lawn mower power and exposure to the elements are drawbacks, but condition is not and the successful bidder took home a quality car with long LBVCR history for a realistic price. 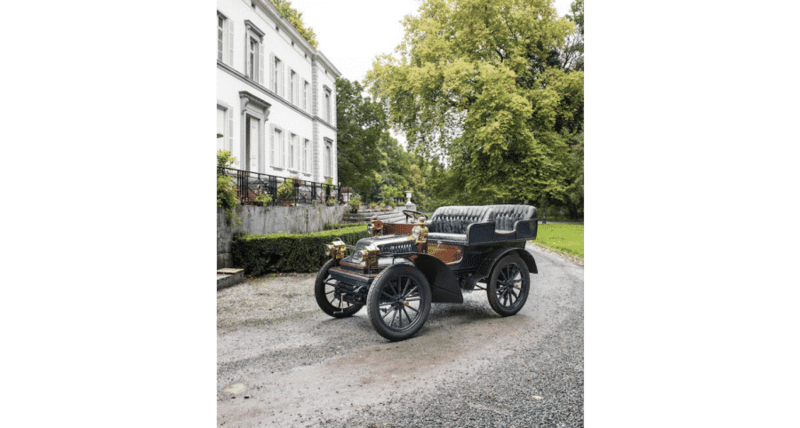 Lot # 204 1903 Oldsmobile Model R 4 1/2hp Curved Dash Runabout; S/N 1803; Black, Green/Black leather; Black top; Estimate $45,735 – $58,802; condition; With Reserve; Hammered Sold at $49,655 plus commission of 15.00%; Final Price $57,103. – RHD. 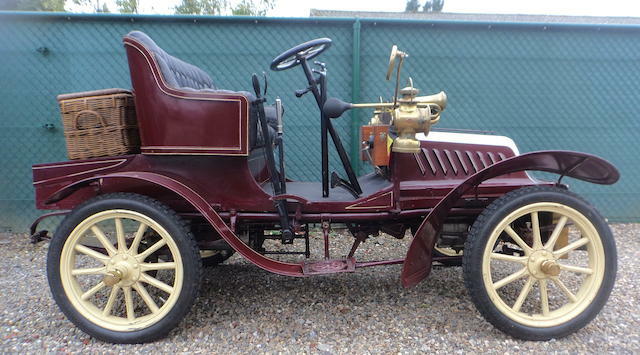 Tiller steering, kerosene sidelights, dos-a-dos rear seat, bulb horn – Essentially completely original and complete, with scant evidence of even minor touchup or repair. 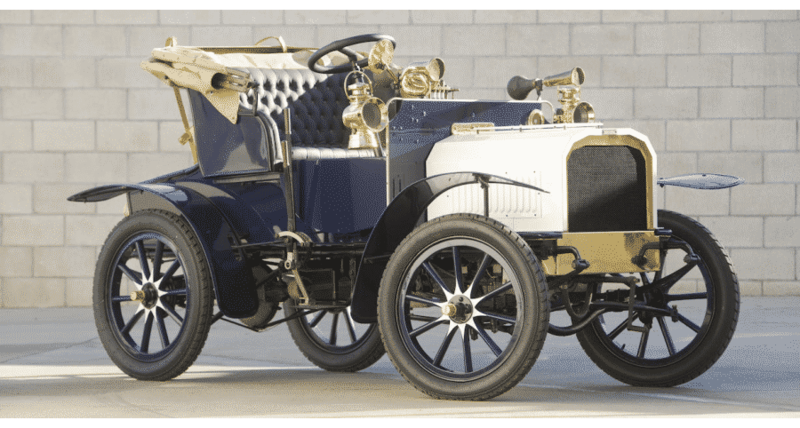 Firmly dated 1903 by both the engine number and several mechanical features like the roller drive chain, bolted differential and finned cooling tubes. Mechanically reconditioned by NP Vintage Engineering, 2015 LBVCR participant. – Sold by Bonhams at Scottsdale in 2013 for $62,100. £ 38,800 at the time so while this result stated in US$ is a modest discount in £ at £ 43,700 all-in it is essentially breakeven for the seller (ignoring the work at NPVE). Full credit to the seller and the shop for not harming its cheerful originality, and for the buyer here for recognizing its quality and preservation. Lot # 205 1902 Westfield Model G 13hp Rear Entrance Tonneau; S/N 316; Light Grey, Black accents/Red leather; Estimate $261,340 – $326,675; Not viewed, notes from the catalog, 2 condition; With Reserve; Hammered Sold at $333,209 plus commission of 12.59%; Final Price $375,154. – RHD. 2.5 liter overhead camshaft 2-cylinder engine made by Philo E. Remington. 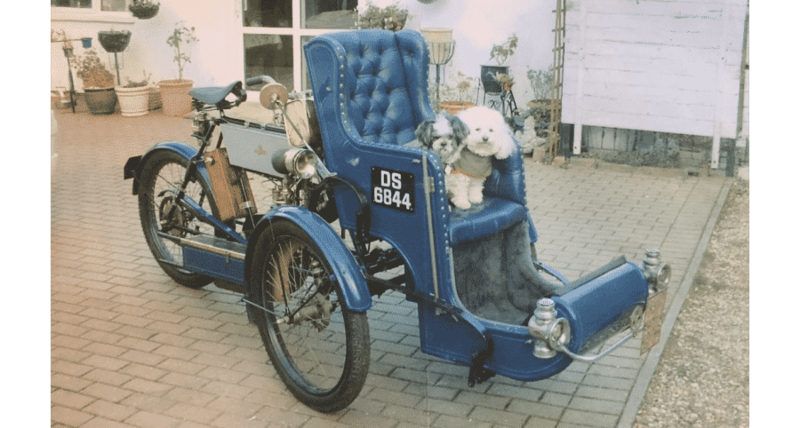 Wheel steering, single acetylene headlight, kerosene sidelights and taillight – Restored some years ago and subsequently shown and toured extensively but still in excellent condition with little evidence of stress. Strong paint, bright brass and good upholstery. VCC dated. Possibly sourced from Barney Pollard’s collection years ago. – Not as fast as an English-built Westfield Seven but plenty powerful enough to cruise at reasonable highway speeds, beautifully restored and meticulously maintained, attributes that contributed to this strong but reasonable price. 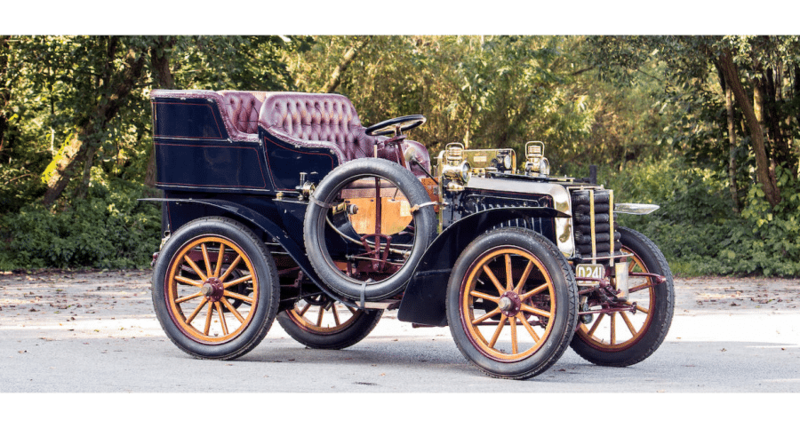 Lot # 206 1903 Darracq Model H 12hp Rear Entrance Tonneau; S/N 3753; Black/Burgundy leather; Estimate $156,804 – $209,072; Not viewed, notes from the catalog, 3 condition; With Reserve; Hammered Sold at $235,206 plus commission of 12.83%; Final Price $265,391. – RHD. Varnished wood spoke wheels, single right side spare, kerosene sidelights and taillights, umbrella basket. – Restored in 1999 and used extensively since including LBVCR, 1,000 Mile Trial, Paris-Vienna and others. 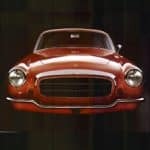 The age of the restoration and the car’s extensive use are evident but so is consistent care and attention. 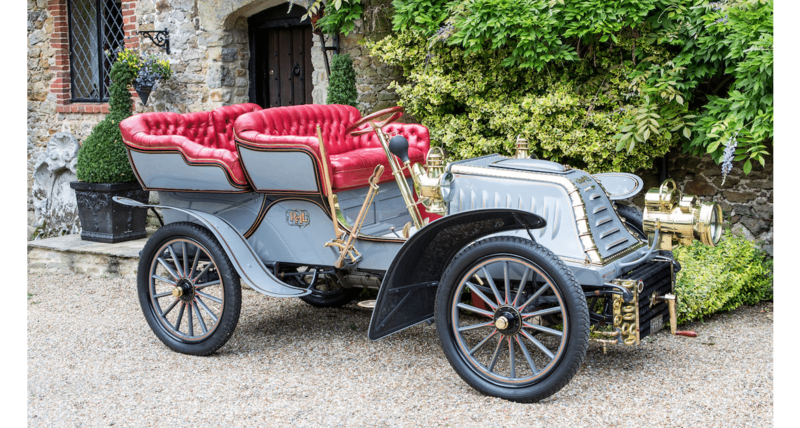 – A quality old car that has been used carefully and had its needs met as required, this Darracq should be put back into reliable touring condition readily. Its good condition is evident from the above-estimate price it brought. 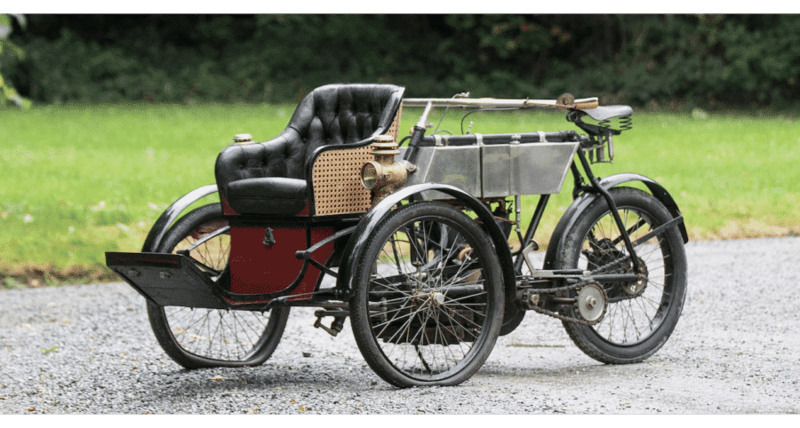 Lot # 207 1900 deDion Bouton Quadricycle; S/N Engine No. 9885; Engine # 9885; Black/Black; Estimate $39,201 – $45,735; Not viewed, notes from the catalog, 4+ condition; No Reserve; Hammered Sold at $58,802 plus commission of 15.00%; Final Price $67,622. 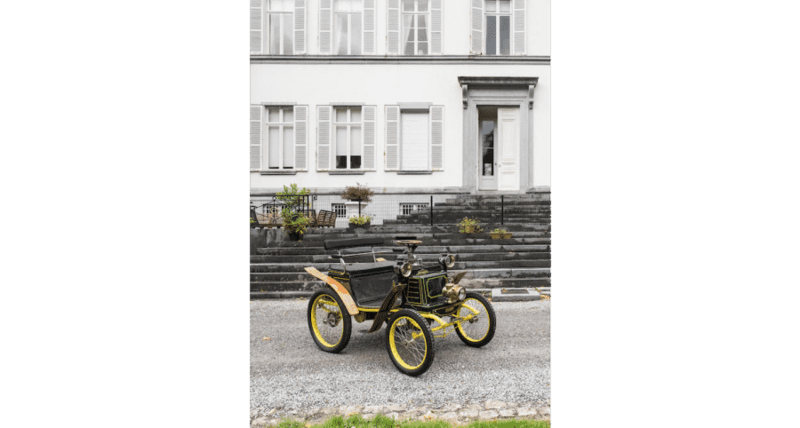 – Bicycle saddle, handlebar steering, Bozier gearbox, single cylinder deDion engine, tool box under the front seat, balloon tires. – Unrestored but sound and complete aside from a few peripheral items. Tired old paint, missing front seat cushion. Displayed for many years and not running but about as simple and straightforward a project as can be. Its patina is marvelous. – Coincidentally I’ve been reading the Charles Jarrott book mentioned in the catalog which makes this deDion’s appearance even more appealing. Its preservation is remarkable and it should only be made to run and drive, never restored. The generous price paid for it suggests the bidders recognized its quality and valued its preservation. Lot # 208 1903 Stevens-Duryea Model L Runabout; S/N 354; Burgundy, Black leather mudguards/Black leather; Black top; Estimate $71,869 – $84,936; Not viewed, notes from the catalog, 4+ condition; With Reserve; Hammered Sold at $66,642 plus commission of 14.94%; Final Price $76,599. – Opposed 2-cylinder engine, tiller steering, concealed front seat, cape top, single Frankonia headlight, Dietz kerosene sidelights. 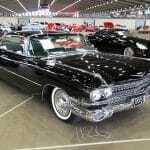 – Unrestored yet impressively original and complete, collection displayed since the 1980’s. Torn old top but sound, probably replaced at some point, upholstery. Missing its left front mudguard covering. Chipped and worn old paint but decent brass. Chassis and running gear are aged, dirty and corroded but not badly. A remarkably preserved early American car. 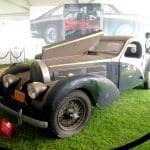 – This Stevens-Duryea is far too good to be restored and will be only a modest challenge to return to running, driving condition. Despite the fact that it has not been VCC dated it is a sound value at this price. Lot # 209 1902 deDion Bouton Type L 6hp Vis-a-vis; S/N Engine No. 8494; Engine # 8494; Red, Varnished wood mudguards/Black; Beige cloth top; Estimate $71,869 – $91,469; Not viewed, notes from the catalog, 3- condition; No Reserve; Hammered Sold at $54,881 plus commission of 15.00%; Final Price $63,114. – RHD. Single cylinder deDion engine, tiller steering, Besnard acetylene sidelights, surrey top, wire spoke wheels, balloon tires. – Sound older paint, upholstery and top, decent brass. Aged and not recently used. Not VCC dated (yet.) All there and well preserved. – It is unlikely this deDion Bouton will fail to be eligible for the LBVCR and even with the attention it needs it is reasonably priced in this transaction. Lot # 210 1899 Vivinus 3 1/2hp Voiturette; S/N Engine No. 85; Green, Yellow chassis, wood mudguards/Black; Estimate $26,134 – $32,668; Not viewed, notes from the catalog, 2- condition; With Reserve; Hammered Sold at $66,642 plus commission of 14.94%; Final Price $76,599. 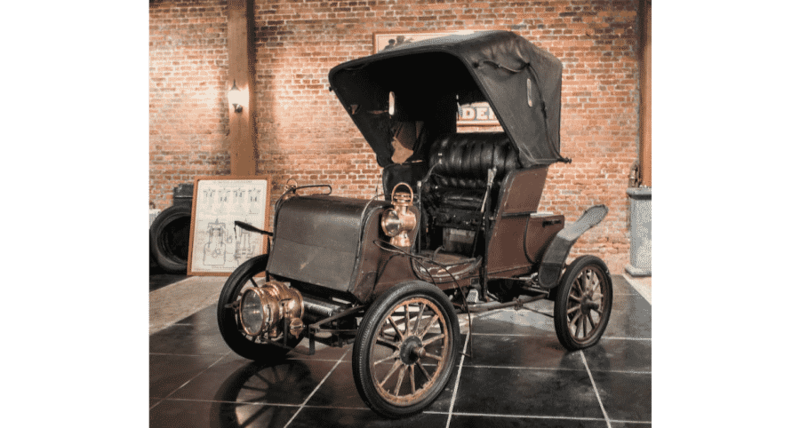 – Lefthand wheel steering, air cooled single cylinder engine, belt drive, single acetylene headlight, kerosene sidelights, wire spoke wheels, balloon tires. – Carefully but not excessively restored with good older paint, upholstery, wood and brass. Believed to be just two families from new. – Not VCC dated but impressively restored and maintained, a probable early starter on the LBVCR that should be usable as is. A rare example of this obscure Belgian manufacturer, which might explain its rather generous price. Lot # 211 1901 Hurtu Type H 4 1/2hp Rear Entrance Tonneau; S/N 2091; Engine # 6377; Maroon, Black accents and mudguards/Black cloth; Beige cloth top; Estimate $84,936 – $104,536; Not viewed, notes from the catalog, 3 condition; No Reserve; Hammered Sold at $71,869 plus commission of 14.73%; Final Price $82,453. – RHD. DeDion engine, 3-speed gearbox, wheel steering, Demac kerosene sidelights, bulb horn, wire spoke wheels, balloon tires, surrey top. Not VCC dated but participated in the 1981 LBVCR. – Restored some time ago to presentable touring standards and gracefully aged since then with little evidence of use. 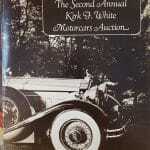 A sound and complete early deDion-powered car that should be readily returned to running and driving condition. – The 3-speed gearbox adds to the complexity but also the drivability of this car which in condition and specification is a good value at this price. Lot # 212 1898 Leon Bollee 3hp Tandem 2-seater; S/N 954; Light Blue/Red; Estimate $58,802 – $71,869; Not viewed, notes from the catalog, 3 condition; With Reserve; Hammered Sold at $64,028 plus commission of 15.00%; Final Price $73,633. – Wheel steering through a rack which turns the entire front axle and forward passenger’s seat, single cylinder horizontal engine, no lighting. – Sound older paint, brass and upholstery, unused in some years and in need of recommissioning, but all there and sound. – A potential early starter for the LBVCR in more than good enough condition to be a proud participant; a third or more of the price it brought is attributable to its early dating and departure time. Lot # 214 1904 La Libellule V-Twin Tricar; S/N Engine No. 1358; Maroon, Black/Black; Estimate $26,134 – $32,668; Not viewed, notes from the catalog, 3 condition; No Reserve; Hammered Sold at $36,588 plus commission of 15.00%; Final Price $42,076. – Bicycle-type frame with 2-wheel front axle, handlebar steering, V-twin engine, wicker backed front passenger seat, kerosene sidelights, cycle fenders. – Resident in Clermont-Ferrand with Antoine Clermont and his son until the early 60’s when it was bought by the consignor and restored, probably three owners from new. 1980’s restoration holding up well but not used in years and the 1904 dating is weak. – La Libellule means the Dragonfly, an appropriate appellation for this lightweight tricar. The price is generous given the work it will need to get back on the road and the sketchy dating that will make LBVCR participation doubtful. 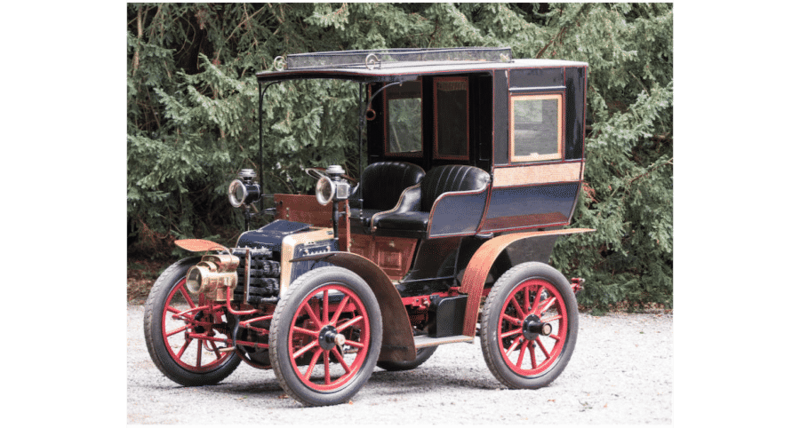 Lot # 215 1908 Germain 6hp Open Drive Limousine; S/N 1; Engine # 1; Blue, Black, wood mudguards/Black leather, Beige cloth; Estimate $196,005 – $287,474; Not viewed, notes from the catalog, 3 condition; With Reserve; Hammered Sold at $261,340 plus commission of 12.75%; Final Price $294,661. – RHD. 2-cylinder Panhard-Levassor style engine, roof rack, single acetylene headlight, kerosene sidelights, bulb horn, Maroon chassis – Atellier Germain’s prototype vehicle, retained by the company in Belgium until 1964 when it was sold to the immediately previous owner, Eugene Segers. Restored some time ago to very good standards and holding up well with sound paint, upholstery and good brass. – Worth this much if only for the remarkable history and far more ‘cute’ than any BMW-Isetta, a diminutive, luxurious, city car with abundant appeal. 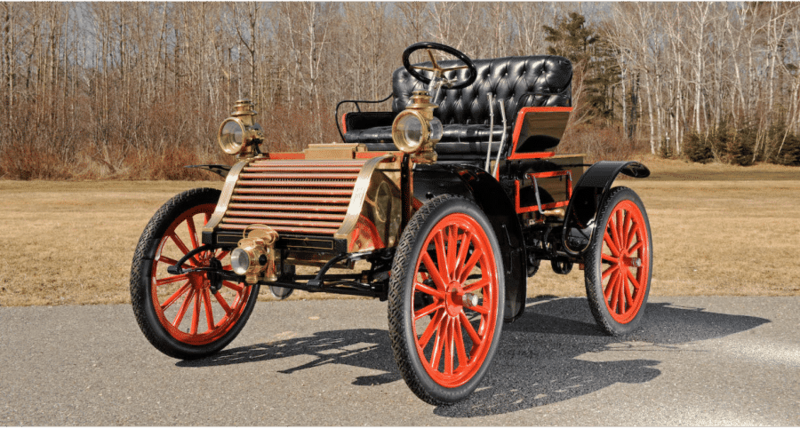 Lot # 216 1902 Toledo Junior Steam runabout; S/N N/A; Black, Red/Black; Estimate $32,668 – $39,201; Not viewed, notes from the catalog, 3 condition; No Reserve; Hammered Sold at $30,054 plus commission of 15.00%; Final Price $34,562. – RHD. Tiller steering, Toledo kerosene sidelights, wire spoke wheels, balloon tires. – An older restoration that has not run in many years but cosmetically is holding up well. The drive chain is missing and the boiler hasn’t steamed in ages so it will require certification. – An ambitious project, but reasonably priced with a high probability of achieving LBVCR eligibility after VCC dating. Lot # 217 1902 Ader V-Twin Rear Entrance Tonneau; S/N V6123; Engine # 219; Blue, Black/Black; Estimate $111,070 – $130,670; Not viewed, notes from the catalog, 3 condition; With Reserve; Hammered Sold at $102,576 plus commission of 13.91%; Final Price $116,845. – RHD. Acetylene Alpha headlights, kerosene sidelights, wood spoke wheels, 904cc v-twin engine, chain drive. – Discovered in the 1960’s and restored by Pierre Schimp with new rear bodywork, then re-restored in the present collection with good cosmetics showing age but little use. 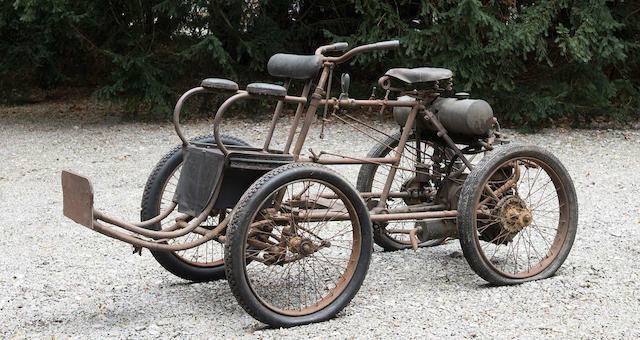 – Ader combined four of their v-twin engines to make a 3616cc V-8 for the 1903 Paris-Madrid race. Good condition, 2-cylinder power and 4-seat accommodations combine to make this a desirable car that brought a realistic price. Lot # 218 1896 Salvesen Steam Cart; S/N SA1; Estimate $196,005 – $261,340; Not viewed, notes from the catalog, 3+ condition; With Reserve; Hammered Sold at $182,938 plus commission of 13.07%; Final Price $206,851. – Vertical boiler served by a fireman from the rear platform, tiller steering, iron shod rear wheels with brake shoes (disc brakes fitted out of sight.) – Built by a member of the Salvesen family for use on its Polmont estate, later owned by John Sword and George Milligen. Restored and used by Milligen, then reworked in the present ownership and a participant in the LBVCR every year since 2004. Runs and drives, boiler is certified and has an entry in this year’s LBVCR. 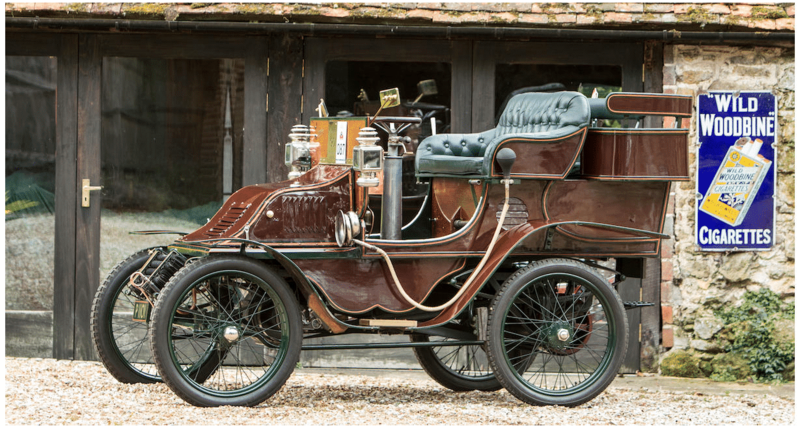 – A rather epic old thing, bought at the Milligen disposition by Bonhams at Goodwood in 2004 for £ 69,700 in non-running condition ($124,687 at the time). It now runs and drives and has failed on the LBVCR only once in the last thirteen years when a rubber tire delaminated. It is worth what the informed bidders here say it is. 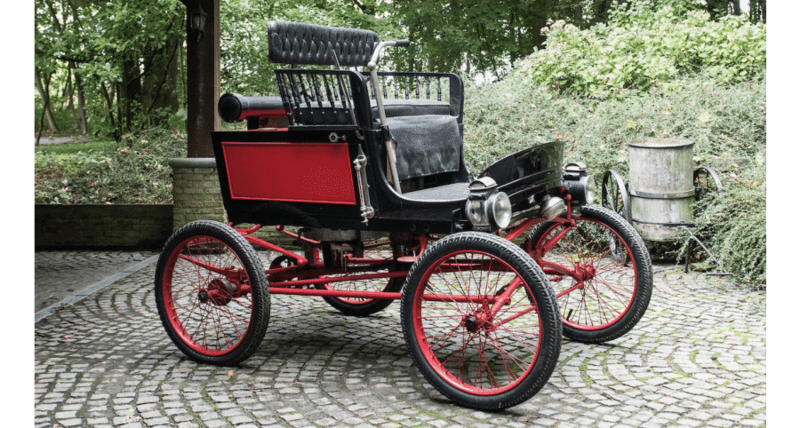 Lot # 219 1898 Daley Quadricycle; S/N 9175; Black, Red/Red; Estimate $45,735 – $58,802; Not viewed, notes from the catalog, 3+ condition; With Reserve; Hammered Sold at $33,974 plus commission of 15.00%; Final Price $39,070. – RHD. 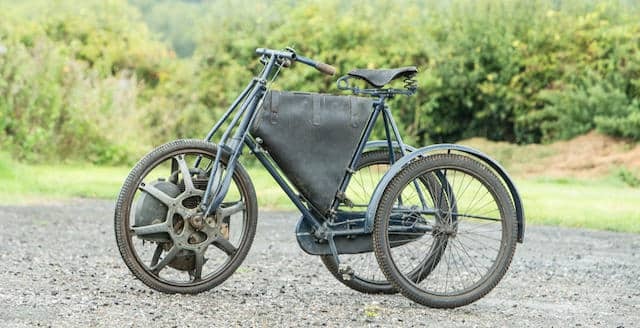 Tiller steering, two linked front wheels on sprung bicycle-style forks, belt drive, 700cc V-twin, kerosene sidelights, wire spoke wheels, balloon tires. – The only known survivor of this Charles City, Iowa marque. Restored long ago by John Barker with a subsequent engine rebuild and cosmetic work in 2012 that is holding up very well. VCC dated. – Modestly priced for an early LBVCR starter, this is a good value. Lot # 220 1904 Humber 8 1/2hp Two-Seater; S/N 2411; Engine # B5413; Blue, White bonnet, black chassis/Black; Beige top; Estimate $65,335 – $78,402; Not viewed, notes from the catalog, 2- condition; With Reserve; Hammered Sold at $70,562 plus commission of 14.78%; Final Price $80,989. – RHD. Wheel steering, kerosene sidelights, bulb horn, cape top. – Restored in the 1950’s, 40 consecutive entries in the LBVCR, then retired. Re-restored in the U.S. with good cosmetics, running and driving with an entry in this year’s LBVCR. – Reportedly sold by Bonhams at Scottsdale in 2015 for $148,500 and offered at Quail Lodge and the Simeone Museum earlier this year. Maybe it’s the LBVCR entry that got the job done, an exceptional buy and drive opportunity requiring only a trip to an outfitter for suitable attire. 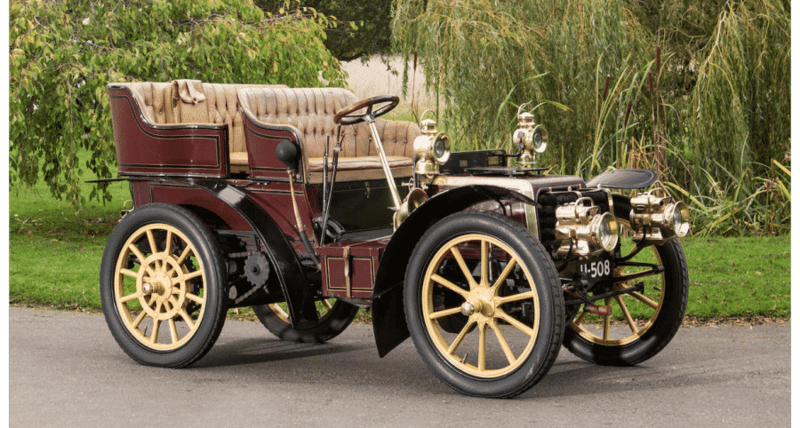 Lot # 221 1903 Panhard-Levassor Model B 10hp Rear Entrance Tonneau; S/N 6090; Burgundy, Black leather mudguards/Beige leather; Estimate $457,345 – $522,680; Not viewed, notes from the catalog, 3+ condition; With Reserve; Hammered Sold at $379,371 plus commission of 12.52%; Final Price $426,856. – RHD. 2.4 liter 4-cylinder, 4-speed, bulb horn, acetylene headlights, kerosene sidelights and taillight, chain drive, Zenith carburetor (original Krebs carb included), VCC dated. 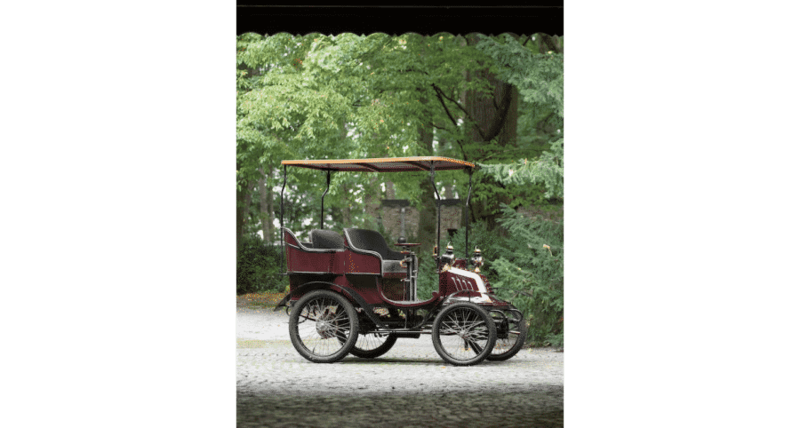 – Known since the early 50’s, coachwork restored in the 60’s, some use on tours and events. Engine rebuilt in 2005, gearbox in 2008. Running and driving in better than just presentable condition. – Certainly by any standard the queen of this auction, a big and powerful automobile for the day with room for friends on tours or the LBVCR. A post-block sale at this all-in price. 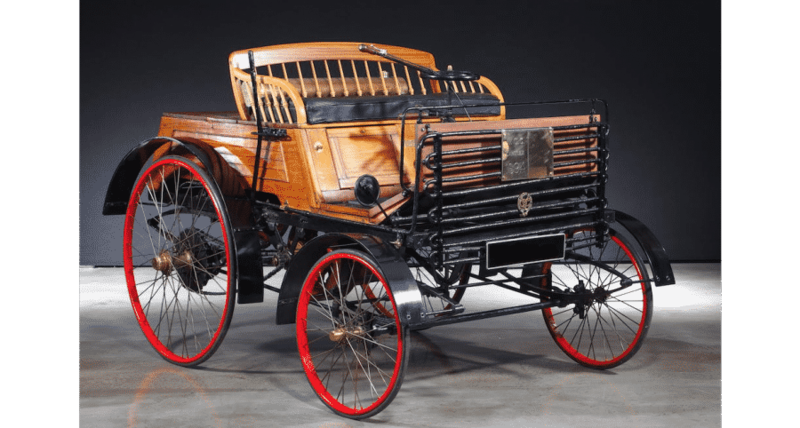 Lot # 222 1894 Santler 3 1/2hp Dogcart; S/N 1036; Varnished wood, Black/Black; Estimate $261,340 – $326,675; Not viewed, notes from the catalog, 2 condition; With Reserve; Not sold at Hammer bid of $196,005 plus commission of; Final Price $196,005. – RHD. Combined tiller and wheel steering, Benz single cylinder engine, wire spoke wheels, solid rubber tires, belt transmission, chain drive. VCC dated. – Built in Malvern, home of Morgan. 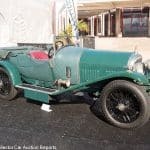 Researched and restored by Dr. Alan Sutton, believed to be the oldest surviving British motor car. Entered in this year’s LBVCR. Very good condition throughout. – It must have been disappointing to miss on this milestone vehicle’s sale but in terms of ‘comparable’ values alone it is hard to value, let alone its unique status in Britain. 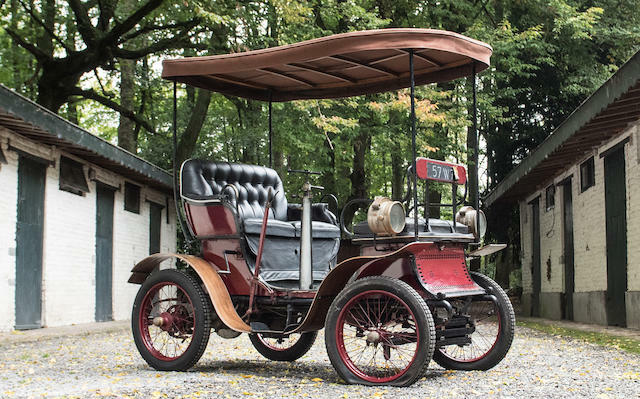 Lot # 223 1901 Schaudel 10hp Rear Entrance Tonneau; S/N 2; Burgundy, Black mudguards/Black leather; Estimate $169,871 – $209,072; Not viewed, notes from the catalog, 2 condition; With Reserve; Hammered Sold at $169,871 plus commission of 13.15%; Final Price $192,216. – RHD. Transverse inline 2-cylinder engine with integral 3-speed gearbox, Ducellier headlights, bulb horn, electric starter, conventional throttle pedal and added brakes. – Restored in the 90’s, engine and gearbox rebuilt in 2016, 12-time LBVCR participant with only one dnf. Very good cosmetics and an entry in this year’s LBVCR. One of only two known surviving examples of the marque. – A car of proven performance in highly presentable condition that brought a healthy but not unreasonable price, particularly with the chance to start the Brighton Run day after tomorrow. 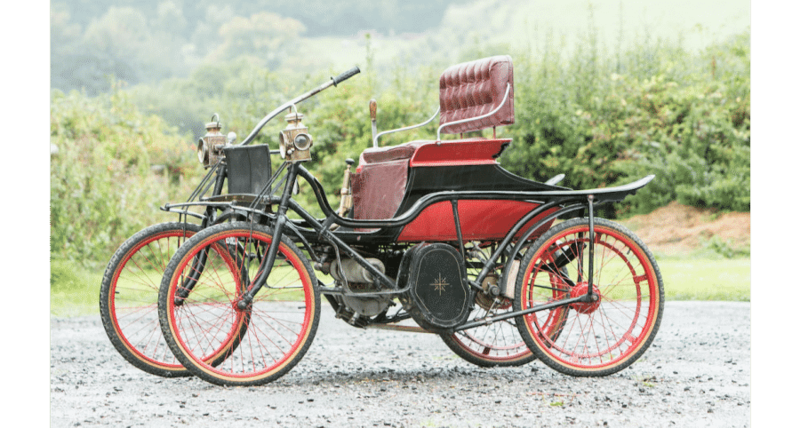 Lot # 225 1901 Singer Motorwheel Tricycle; S/N N/A; Black/Black; Estimate $32,668 – $45,735; Not viewed, notes from the catalog, 4 condition; With Reserve; Hammered Sold at $74,482 plus commission of 14.63%; Final Price $85,380. – Single cylinder engine, fuel tank and magneto packaged inside the cast aluminum front wheel, auxiliary fuel and oil tanks within the bicycle-style frame. – Largely original but not run in years, a restoration project that one might hope will preserve its originality while making it operate. – An intriguing concept made even better by its originality, the bidders endorsed it enthusiastically with this price. Lot # 226 1904 deDion Bouton Type Y 6hp Two-Seater; S/N 16532; Burgundy, Cream coachlines/Black; Estimate $78,402 – $104,536; Not viewed, notes from the catalog, 3 condition; With Reserve; Hammered Sold at $65,335 plus commission of 15.00%; Final Price $75,135. – RHD. Single cylinder, 3-speed, Lucas King of the Road kerosene sidelights, electric taillights, wicker basket, bulb horn. – An older restoration with several Brighton Runs to its credit. Sound paint but tired and cracked upholstery, bright brass. VCC dated. – Sold by Bonhams at Olympia in 2007 for £ 47,700, $98,539 at the time. This result is £ 57,500 all-in, more expensive in £ but less in US$, and a sound value for the new owner. 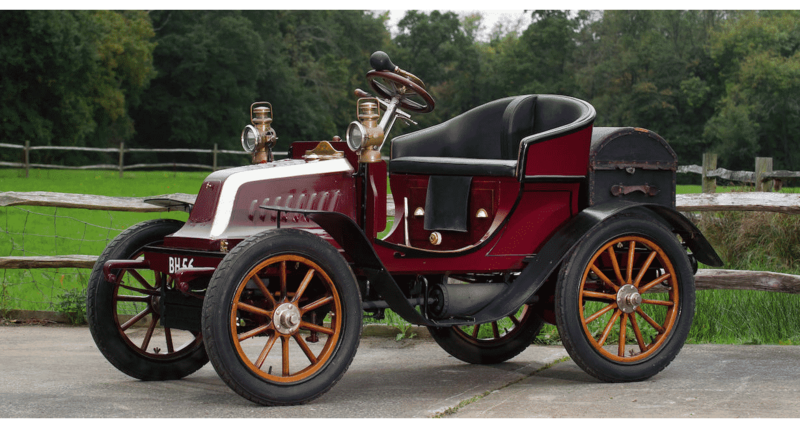 Lot # 227 1903 Eldredge 8hp Runabout; S/N 71622; Black, Red accent and wood spoke wheels/Black; Estimate $58,802 – $71,869; Not viewed, notes from the catalog, 3+ condition; With Reserve; Hammered Sold at $42,136 plus commission of 15.00%; Final Price $48,456. – 1962 AACA National First Prize. Lefthand drive. Single unbranded acetylene headlamp, dual kerosene sidelights, Dietz kerosene taillight. Opposed flat twin, 3-speed gearbox, chain drive. Pennsylvania assigned VIN. – New body, old restoration, cracked paint on wood body panels. Sound upholstery. Recurved leaf springs, platform rear suspension. Automatic intake valve. Brass trim except nickel gearshift and brake levers and steering wheel column. Rear axle contracting band brake on rear axle. Foot operated external drum brake on drive shaft. One of the first lefthand drive, wheel steered American automobiles, built by the National Sewing Machine Co. in Belvidere, Illinois. Ex-Dr. Sam Scher and Richard C. Paine, Jr., a car with marvelous and important U.S. provenance. 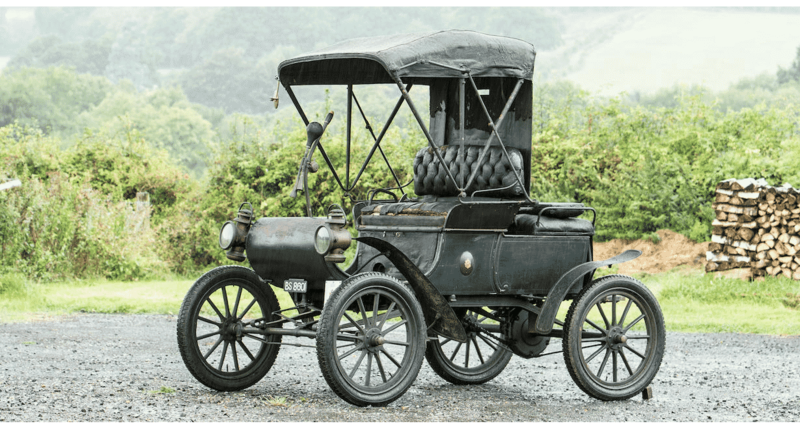 – Sold at Bonhams auction of the Paine collection in 2008 in non-running but decent cosmetic condition for $117,000, a good example of what the excitement of a single owner collection auction can do. It has been brought back to running, driving condition since and has made several Brighton Runs but at no small cost to the seller in this post-block negotiated transaction. On the other hand, the buyer who waited for it went home with a bargain.